A clogged drain is a nuisance . It makes showers uncomfortably awkward and using sinks a race against time before the whole room's transformed into a flooded mess. While a number of drain-cleaning products are available on the market, the results aren't always guaranteed and these products can be costly. 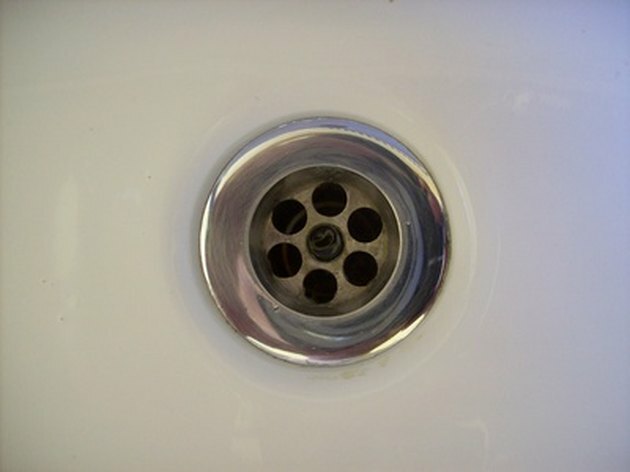 Save both time and money by unclogging the drain yourself using a homemade "Liquid Plumber." It only takes a few minutes and makes use of products you likely already have in your home. Pour half to three-quarters of a cup of baking soda into the clogged drain. Pour half a cup of vinegar down the drain and quickly cover the opening with your hand, a cloth, or the drain's stopper plug so the chemical reaction forces itself through the blockage instead of rising back up into the basin. Wait a few seconds and pour another half cup of vinegar down the drain, making sure to cover the opening to control the reaction. Wait about 15minutes; in the meantime, boil a gallon of water. Pour the gallon of water down the drain to clear out the drain. You can also flush it out using hot water from the tap.